So you want a website, but you don’t know HTML, you barely get what a URL is and you’re wondering what in the world SEO is. This isn’t a reason for my Black female entrepreneurs to give up and start posting on facebook instead. Having a website is critical. It’s your online headquarters. Everything you do with social media, email, webinars, podcasts, video should drive people to an online home base where customers can learn more about you, purchase services and products and become loyal members of your own community. Too often, I see Black female entrepreneurs on the guerrilla marketing grind with no website. I see the daily posting in groups and showing up with pop-ups at fairs. These are solid marketing strategies to consider, but they should not be implemented absent a larger marketing strategy. A website or webpage is central to a digital marketing strategy for any business. I get it though. If you are non-techie, you’re putting it off because you don’t know where to start. If you’re bootstrapper, you might be hesitant due to cost. If you take nothing else away from this post, please remember this: just because you aren’t great with technology or digital marketing, it doesn’t mean you can’t have a GREAT website that gets a ton of traffic, builds a great email list and converts visitors into customers — and it doesn’t have to cost a ton of money. You can’t make quick and simple changes to your website. You don’t have access to the back-end of your website where revisions can be made. You aren’t sure how to communicate what you want to your designer. You overpaid for the work or the work is not completed and you’ve paid. Your web designer spazzes out on you. Your web designer isn’t responsive to your requests. Keep one folder with all files and related information for the website in it. Set up a document in the folder called “accounts and passwords”. Store all accounts and passwords and logins for the site and all related vendors here. Sign up for your hosting, URL, SSL and wordpress account, email marketing subscription and all other accounts on your own. Use your own password and login. Change this information after the job is complete if you don’t intend to work with the vendor again. Some companies (like Godaddy.com) allow you to create a password and login for your site freelancers. Use this feature if it is available. Purchase your own template from WordPress, Weebly, Wix, Squarespace, Template Monster or any other content management system. Pick a responsive template. That means it is designed to be viewed on a desktop, laptop, tablet, or mobile device instead of just being made to view on a desktop. If you plan to build an email list – and you should – sign up for your email marketing account. Try Mailchimp or Aweber. Add the login and password to your account/password document. Sign up for Paypal or whatever e-commerce payment solution vendor you’ll use. DON’T share this password and login in a shared document. Keep this separate and protected because it’s tied to your bank account. Have your logo in multiple versions and sizes, color palette, and stock photos ready to go in the website folder in advance. If you use real photos, please make sure the photos are high resolution photos. Have your edited biography and high-resolution headshot ready to go and in the folder. Please have a professional headshot done, Sis. Just my two cents on that one. Write a lot of evergreen content until you get a revisions and maintenance plan down. Evergreen content is content that doesn’t get outdated over time, like your business mission and vision, overall company description, or tips and tools that are timeless. Register your business name and website url with Google. Prior to meeting with a developer, find 4-5 examples of what you like – example websites, images, colors, navigation menus, layout, etc. – and write what you like and don’t like about each example. Find a designer who comes highly recommended by someone you trust. If you don’t have a referral, read the online reviews for web developer/designer first and be sure to pick someone who has a GREAT portfolio of sites you love. Communicate deadlines, expectations, and detailed descriptions of what you want done, up front and in writing. Go over the list via Skype or via a video call where you can share a screen. Always find a backup vendor in case your designer goes MIA! Don’t pay the complete amount until the job is DONE to your full satisfaction! Take a course or hire a coach to teach you how to change simple things. My WordPress coach was GREAT. Ask your web designer to avoid too many plug-ins and to clean out plugins that aren’t in use. Plug-ins are software add-ons that you upload to your website to extend features or functionality of your website. An example: adding a forms plug-in can allow you to add a contact form to your website. Ask your web designer to add a Google Analytics chart to your dashboard so that you can keep track of traffic coming to the website after it’s up and running. Make sure you get your google analytics ID yourself or have the designer give it to you. Put it on your passwords and accounts list. Ask your designer to enable SEO on the back end of your website. It will help people find your site in google and other search engines. This usually involves a plug-in or the check of a box. Keep in regular contact with your designer/developer and be responsive to his or her requests. Establish working hours in your initial conversation, especially if your developer is overseas. Ensure that any difference in language is manageable. Check out Upwork.com. This is a great place to find web designers, developers and graphic designers. You can ask a freelancer to quickly set up your email marketing service and Paypal with your website. Remember; screen, screen, screen. Ask your designer to speak in layman’s terms when communicating and explaining key changes to you. You’ve got to learn the basics of this stuff. The internet isn’t going anywhere and your website is your headquarters. It takes some time to understand and speak “website” language, but you will grow and learn over time. Check out my website glossary for a better understanding of commonly used developer language. Listen to podcasts that talk about the platforms you have chosen. I learned much of this in 6 months, myself. Be patient with yourself, read a lot, ask questions and stay the course. You GOT this, Sis. Use my FREE Website Planning Checklist to get ready for your website design experience. Don’t rush. Plan well before connecting with a web developer/designer. Planning in advance and facing your fears of building a website will pay off – literally. Go for it! 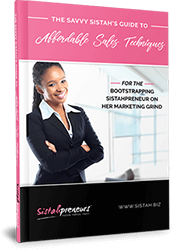 Makisha Boothe is business coach and founder of Sistahpreneurs. She specializes in rapid improvement and innovation, and helps women with business startup and design. Very inspiring! Thanks for the insight. Thank you for reading! I am glad that I could provide some insight.